There is an ongoing debate among gamblers as they try to determine if Blackjack is a game of skill or of chance. There are good arguments going in both directions, and in this article I will try to give you an introduction to my thoughts on the matter and hope that you will share yours in the comments section. I think Blackjack is mostly a game of skill. The reason I make such a claim is, that when a player learns the strategy to play Blackjack, the casino has a very small (to non existent) edge on the player. If you dedicate yourself to learn Blackjack strategy, the casino you are playing at only has a 0.5% edge over you, which is much less than most other casino games. 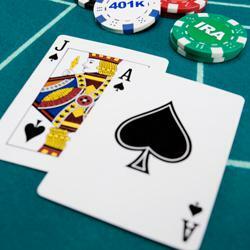 The Blackjack strategy is based on mathematics and it takes a lot of skill from the player to be able to master it. This means that regardless of luck and the cards that may be dealt during the game, the final result could be completely controlled by the player if a strategic approach to the game is used. Some players prefer Blackjack to be a game of luck because they play it just for fun and find more excitement in not knowing what the results will be. However, I am sure that many players would like to turn their favorite hobby into something profitable, and they should be aware that this is possible and as simple as learning a few rules to the game. Others argue that any card game is a game of luck because you cannot predict the cards that will be dealt, nor what the next card will be, and I will say that I completely disagree because odds are a wonderful thing that allow gamblers to make predictions on what the next card will be. Thanks to odds and strategy, most online casino games can be enjoyed by players at the same time as they bring a few extra bucks in.